How often do you just throw your smartphone when you’re home? Once, twice or every day? Well, it’s very natural, especially when we are quite tired. Finding the phone is also easy, thanks to the bigger screens and all. Even if you’d not see it around, you can just call the phone and follow the ringing sound. In the end, you’ll find where exactly your device is. But wait, how do you locate Android phone of yours if it is in silent mode? Suppose you were in an office meeting and forgot to disable the silent mode! Of course, you can’t follow the ring for finding your phone. And, even if you have enabled Vibration in Silent Mode, it isn’t a practical solution. In short, you are kind of trapped if you can’t find your Android phone while it’s Silent, don’t you think? Fortunately, YOU ARE NOT. You have some interesting ways to locate your Android phone even when it’s in silent mode. 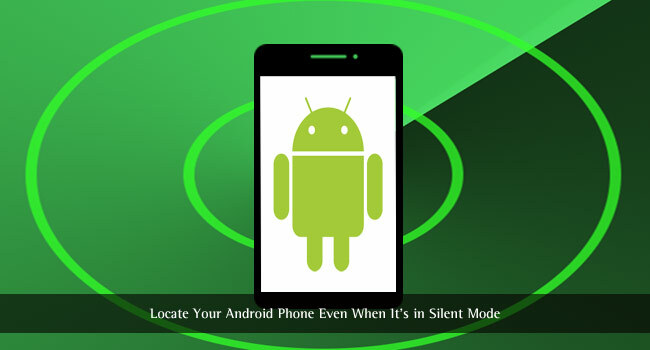 In this article, we will tell you how you can find your Android Phone that’s in silent mode. For each method, there’s a bunch of requisites. So, as a precaution, you can set up any of these methods — so that you will not have to worry if you misplace your device. In this method, we are using Android Device Manager. If you didn’t know, Android Device Manager is a service that’s helpful for locating and controlling your Android Smartphone or tablet PC. Provided that your phone has an internet connection, you can use ADM to locate, lock or erase your device. This service is used for finding lost devices too. At the least, you can protect your data from being misused. 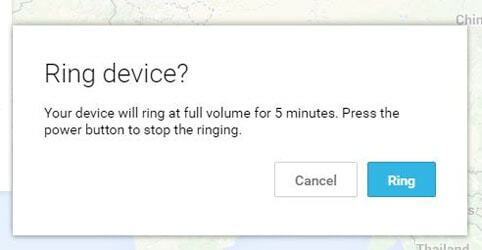 Here, however, we can use Android Device Manager to ring a phone in silent mode. Under the tab, you’ve to enable both options — Remotely locate this device and Allow remote lock and erase. So, when you don’t have access to your device, Google can be used for regaining access. In addition, you should sign into Google Accounts using the account used on your phone. Now, follow the steps given below to find your Silent phone. Open Google Account Settings and find Android Device Manager from the menu. 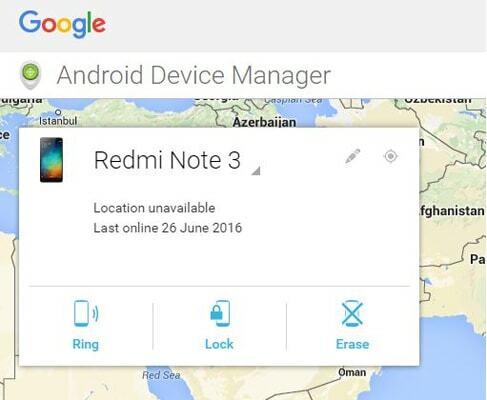 Alternatively, you can just search ‘Android Device Manager’ and go to the first result. In the coming interface, there will be a box that shows information about registered devices. In the prompt window, go for ‘Ring’ once again. Given that your phone is connected to the internet, it will start ringing for 5 minutes in full volume. The sound will not go off until you press the power button. Needless to say, it works in silent mode too. So, this is perhaps the best way to locate your Android phone that had an active internet connection. However, if you hadn’t turned on data connection in your phone, this method won’t work. If the abovementioned way isn’t possible for you, try this one. Here, you don’t need an internet connection. Ring My Droid is a completely free Android app you can get from the Google Play Store. This app has been designed to help you find your device in silent mode. Unlike Android Device Manager from Google, this method relies upon SMS. 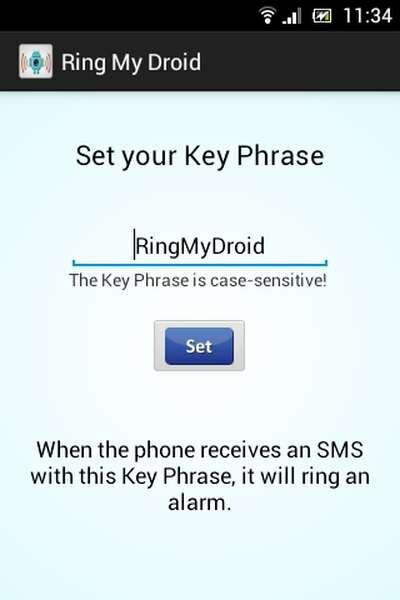 To make use of the device, you should have installed and set up Ring My Droid in your phone. Now, we will move to the actual procedure. First, you have to download the app from Google Play Store. it’s pretty lightweight and the size is just 402KB. It does work on almost all devices that run Android v2.1 and later versions. After you have installed the app, you will be asked to set up a ‘Key Phrase. To be noted here, this key phrase is going to be the alarm trigger on phone. So, choose something that you only know. If someone else knows the key phrase, he/she can use it for a prank, you know. So, the next time you don’t find your phone around, grab another phone. Now, you have to text the key phrase to your number. As soon as your phone receives the text, it will start ringing. In that time, you can locate the device. Therefore, as you have seen, Ring My Droid does not require a data connection. On the contrary, your device has to receive the SMS message — via a cellular connection. But, once again, if your device does not have cellular coverage inside home, it won’t work. Don’t worry, we have one more alternative method to locate Android phone of yours. 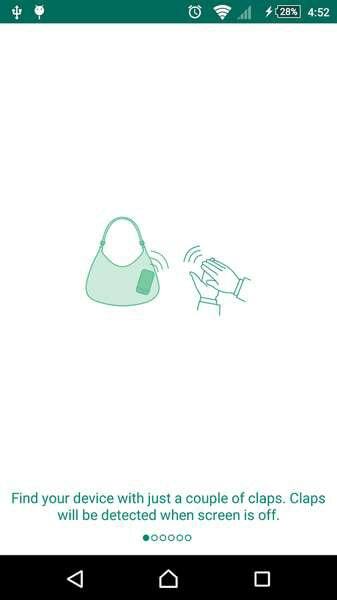 If you put your phone in your bag and forget where it is, you can use Clap to Find to locate it. Clap to Find is one free app you get from Play Store and it can be installed in no time. It too has a small set-up process, but it’s interesting. In this app, your claps are used as the trigger for ringing your phone. Once you have downloaded and installed Clap to Find, you will be shown a set-up interface. In this interface, you got to clap three times to configure the locating system. 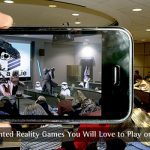 The application will record the intensity and frequency of claps. It’s weighed around 6MB and has proven pretty much useful. The best part of Clap to Find is that you can customize the way it works. For instance, you can enable Sound, Vibrate or Flash as the alert method. As in case of ringtone, you can choose the ringtone to be played. Another feature we’d found interesting is the one to pause clap detection in certain hours — for instance, when you’re in office. The app is to be turned on when you put your phone in Silent Mode. As we said, it’s pretty simple. Next time you don’t see the phone, just clap THREE times. If the intensity and interval of claps are correct, your device will start ringing. So, you can go and locate the device easily. In personal experience, the app was able to detect the sound made around 10ft away. And, it depends upon your device microphone too. As opposed to the first and second method, this one requires neither data connection nor cellular connection. However, the device needs to be somewhere around you. 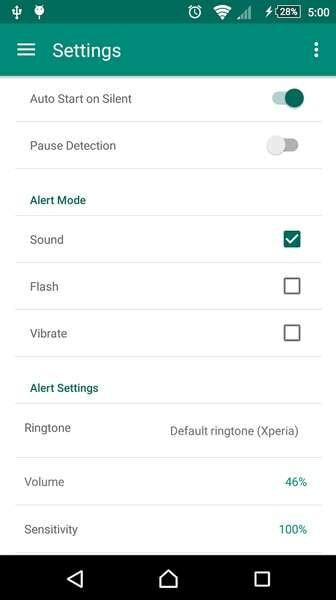 So, you have seen some cool ways to locate Android phone when it’s in silent mode. Depending on the condition of a device, you can pick the right method from list. Everything has its own limitations and advantages. However, if you’d enabled any of them, it will be useful in certain situations. Do you know any other ways to find your phone when you have put it in silent mode? Do let us know. These are great tips. You can also, if you are really prone to losing things, use an RFID tag sticker and track it on your desktop. Works for anything, even car keys. Thank you, Nancy, for adding this valuable tip. I love this article. I am one of the persons who keep loosing my phone and finding it in very strange places. LOL. These tips are of great help especially the clap to find! The best tips I have ever heard about finding my device when it is in the silent mode. Just finger crossed that it will work for my HTC Desire 820 smartphone. I really love this article it is very educative because I used to blame many people after misplacing my smartphone but now I will apply this simple procedure once iImisplace it and thank you for posting this. You described it in so easy and simple way, keep informing. Thanks for the interesting post. it will help you to find your mobile.